Eating berries can help manage Diabetes: Berries are some of the best food that a person with diabetes can eat. Although berries are sweet but they don’t have a negative impact on blood sugar levels as they have a low glycemic index. The Glycemic Index (GI) is a relative ranking of carbohydrate in foods according to how they affect blood glucose levels. Foods that have high GI value tend to increase blood glucose level rapidly, whereas foods with low GI value slowly increase blood glucose level. Raspberries, Blueberries, Blackberries, and Strawberries all have low GI value and are safe to eat. Health benefits of berries do contain fructose, a natural sugar that doesn’t need insulin to be metabolized. The key to managing diabetes is to practice portion control and consume foods with low GI value. Berries for weight management: Berries are a great choice to manage weight. Berries are loaded with fibers including soluble fiber, which steady down the movement of foods through the digestive system leading to a feeling of fullness and reduce hunger. This results in a decrease in calorie intake and better weight management. Berries work the most in churning out fats that are accumulated near the abdominal area. Berries improve vision: One of the major health benefits of berries such as Strawberries, blackberries, cherries, and blueberries are great for reducing inflammation and blood pressure, one of the major risk factors for macular degeneration. Vitamin C in berries helps to prolong the development of cataracts. Berries help to keep the retina strong and keep the vision healthier and long-lasting. Berries boost the immune system: Berries are a great source of antioxidants, such as ellagic acid, resveratrol, and anthocyanins which may help reduce oxidative stress, prevent damage to your cells and protects the immune system against deficiencies. Strawberries, blackberries, and blueberries not only taste great but they are also a great source of flavanols which are highly effective antioxidants. Berries are good for your brain: Berries contain antioxidants, which help protect cells from damage by harmful free radicals. 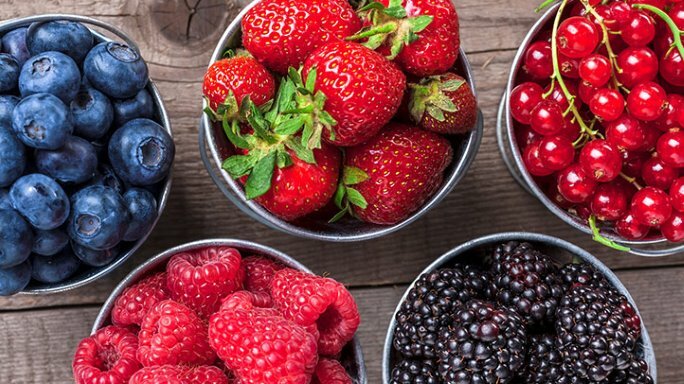 Berries alter the way neurons in the brain exchange messages. Such modifications in signaling can stop inflammation in the brain that contributes to neuronal damage and enhances both motor control and cognition. Berries are beneficial for those people who suffer from Alzheimer’s & Parkinson’s disease. Children who suffer from dyslexia and slow learning are also advised to eat berries. Berries help fight urinary tract infections: Blueberries may help prevent urinary tract infections. A compound called proanthocyanidins in blueberries averts bacteria from sticking to the walls of the urinary tract. Also, the substantial amount of vitamin C in blueberries resists the growth of bacteria in the urinary tract. Berries take care of your heart: This superfood can help lower the risk of heart disease. Raspberries contain plenty of fibers, which help lowers cholesterol. Soluble Fiber forms a gel that eliminates cholesterol as it moves through the intestines, reducing the amount of cholesterol that enters into the bloodstream comes in great health benefits of berries. Anthocyanins, a type of antioxidant found in berries might raise “good” cholesterol or HDL, and lower the “bad” cholesterol or LDL. Strong colored berries such as blackberries and blueberries contain more anthocyanins than lighter-colored berries such as strawberries and raspberries. Berries also have other likely heart-healthy antioxidants, including vitamin C, quercetin and ellagic acid. Tannins, a type of antioxidant also have cardioprotective benefits. You might want to look into consulting with a Nutritionist or Dietician for various reasons for better health and fitness or to know more about eating right. At Qua Nutrition, we believe in understanding what you are looking for and gradually modify your diet plans to bringing permanent changes in your life for better health. Changing nutrition behaviour based on your comfort level, age, genes, goals, timelines and other factors determine the success of the Nutrition plan. Best dietitian in India knows how to change the way you eat.